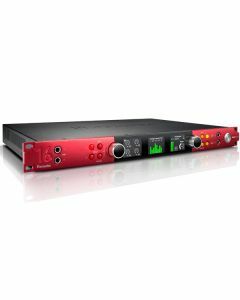 Red 16Line is a 64x64 Pro Tools | HD and dual Thunderbolt 3 audio interface with ultra-low latency A-D/D-A conversion, Red Evolution mic preamps, up to 121dB dynamic range, ultra-low round trip latency, and expansion over Ethernet for networked audio. High-performance audio conversion with over 118dB dynamic range A-D and 121dB dynamic range D-A (A-weighted). These converters have been expertly selected and calibrated to provide the best balance of sound quality, dynamic range and conversion latency in their best-quality audio interface. Red’s ultra-low round trip latency completely transforms your workflow. If you’re used to having to build two different mixes – one using input monitoring to overdub, the other using the DAW for playback – the good news is that now, one is enough. Build your mix on the DAW and use it whether you’re overdubbing (monitoring the input you’re recording with the Focusrite Control software mixer) or playing back, with all your plug-ins in place, all the time. Focusrite Control is their software mixer designed primarily for ease of use in quickly setting up both simple and complex monitoring and routing configurations, together with the ability to control your preamps remotely. Every Red interface comes with Focusrite's Red 2 and Red 3 EQ and compression plug-ins. AAX/AU/VST-compatible, these plug-ins faithfully reproduce the sonic qualities of the original hardware, allowing you to take advantage of the classic Red sound – the sound of professional recording studios all over the world – across your entire mix.